The branches of apple trees are gnarled and angular and, when burned, they produce the most deliciously fruity, sweet smoke. 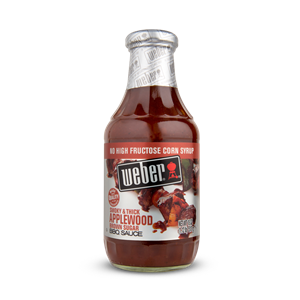 Weber’s flavor experts harnessed that fruity sweetness here, creating a new twist on a classic grilled flavor. Tomato Puree (Water, Tomato Paste),Sugar, Vinegar, Brown Sugar, Food Starch-Modified, Salt, Natural Applewood Smoke Flavor, Molasses, Caramel Color, Spices, Xanthan Gum, Onion, Red Pepper, Garlic.